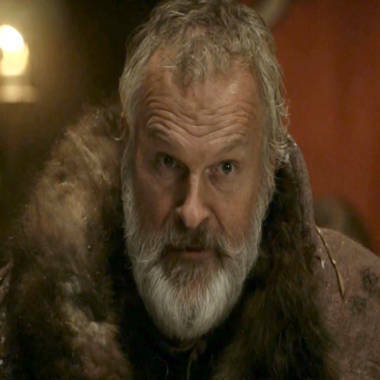 Clive Mantle in his role as Lord Jon Umber on HBO's "Game of Thrones." It's not unlike a scene that could take place in Westeros. "Game of Thrones" actor Clive Mantle, who plays Lord Jon Umber, better known as The Greatjon, on the first season of the HBO show, had part of his ear bitten off on Sunday, the BBC reports. Mantle, 55, was in a Travelodge hotel in Newcastle, England, when he was bitten. A spokesman for the actor's agent told the BBC that Mantle asked other guests to keep the noise down and then was pinned to the floor and attacked. The top part of his right ear was bitten off, but surgeons at the Royal Victoria Infirmary sewed it back on, the spokesman said. The BBC reports that one man has been charged in the incident and will appear in court next month. Another man was released on bail and a third released without charge. Mantle was in Newcastle starring in a play, "The Ladykillers," which was supposed to continue its run in Salford, England on Tuesday. A publicist for the play told the BBC she did not know when Mantle would be able to rejoin the cast. In one episode of "Game of Thrones," Mantle's character has two of his fingers bitten off by Robb Stark's direwolf, though his ears remain untouched.